SureFire, known for their high-end tactical flashlights, has traditionally used the CR123A lithium battery (which are commonly used in photography equipment) in their lights. This battery is compact and holds a lot of power, but they are quite expensive and are not rechargeable. For 2010, SureFire has released a brand new variant of the E2L Outdoorsman that runs on two AA batteries, instead of the usual two CR123A. The SureFire E2L AA Outdoorsman features 80 lumens of light for 9 hours on high output mode with Energizer Lithium AA batteries, and 3 lumens for 60 hours on low output mode. 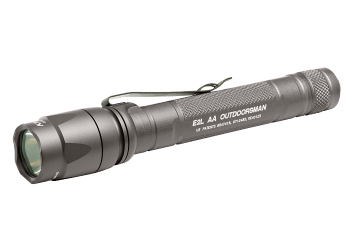 As with all SureFire flashlights, the E2L AA comes with a lifetime warranty, and a set of lithium batteries are included with the light.